Leo Vegas Casino Review - FREE €/£/$400 Bonus at Leo Vegas! Only a few currencies and languages are supported. Visit Leo Vegas Get Your Bonus! Leo Vegas Casino utilises a variety of highly secure gaming software and is certified to be safe and secure. Fully licensed and regulated. Licensed in Malta... ... regulated by the Lotteries and Gaming Authority and certified safe. Fast, Reliable Withdrawals in just 1 day - many are done instantly. ? Make your first deposit and Leo Vegas Casino will match it up to €400 plus 200 free spins on Starburst. You start earning your bonus simply by signing up and making your first deposit. ? The long trip from Europe to Las Vegas might not be in the cards for a while, due to time and money constraints, but getting to Leo Vegas is a cinch. In fact, within a few minutes you can be logged onto the site and playing. Furthermore, the similarity between Leo Vegas and the real Las Vegas goes way beyond name alone. The online casino Leo Vegas, just like Las Vegas itself, welcomes all kinds of gamblers, experienced and inexperienced, big bettors and small bettors and, slot players and table game players, Both gambling destinations provide 24/7 nonstop action and excitement on virtually any casino game of your choosing. Leo means lion in Latin, and lions signify power, strength, and determination. Presumably, as a player at Leo Vegas Casino, you feel your own power to win big or at least you hope you have that power. Of course, many casinos know how to make you feel that way, but what sets Leo Vegas apart from the pack is that you are unlikely to find any online casino that is more perfectly suited to the special needs of those who prefer to play on mobile devices. With the extremely busy lifestyle that is so prevalent today, many people are continually on the go. Limiting play to only those times when they can be logged on to their own home computer for a prolonged period of time is simply not practical. But on the other hand, for anyone who views playing on an iPhone or tablet not just as a convenient and enjoyable way to kill time, but also as a way to try to win money, most mobile casinos fall short. You need a bigger and better game choice than most mobile casinos give you. Leo Vegas online casino is to be commended for specifically addressing this need. Most online casinos are primarily intended for players who wish to download the software onto their computer. Many of them add their miniscule mobile version later as an afterthought in order to be more competitive in today's market. However, expanding their mobile offerings to even come close to the huge number of games that are available in the downloaded version is not a priority. By contrast, Leo Vegas Casino was specifically targeted for mobile and tablet users and created from the outset with that segment of the population in mind. Leo Vegas internet casino is not only the biggest mobile casino in Europe today, but also widely regarded as Europe's most user friendly mobile casino in Europe. It is the No. 1 go to casino for players who want a fast, smooth running mobile casino that will not only consistently work on their Apple iOS or Android device wherever they happen to be, but give them the same wide range of game choices they would have in a downloaded casino. Although you can download the casino software onto your PC, you probably won't want to bother if you own a mobile device. That is how much the mobile casino resembles the downloaded casino. Leo Vegas is a relatively new casino, having only been established in 2012. But while still a work in progress, it has become very popular with European players who use mobile devices and recognize a good mobile casino when they see one. Keep in mind that Leo Vegas was first developed in Sweden, and while its availability now extends to other countries, the casino is still primarily aimed at the Scandinavian market, with bonus offers and banking intended for that customer base. Residents in certain other countries, though able to play, won't be able to receive a Welcome Bonus and may not be able to use their preferred currency and deposit method either. U.S. residents cannot play at all. Leo Vegas online casino is licensed and regulated by the Lotteries and Gaming Authority of Malta and EU registered. The casino was the winner of the 2013 EGR Innovation Award. It was also a finalist for the ICE Total Gaming Award for Best Operator of the Year. Rather than relying on just one software provider, Leo Vegas uses many. 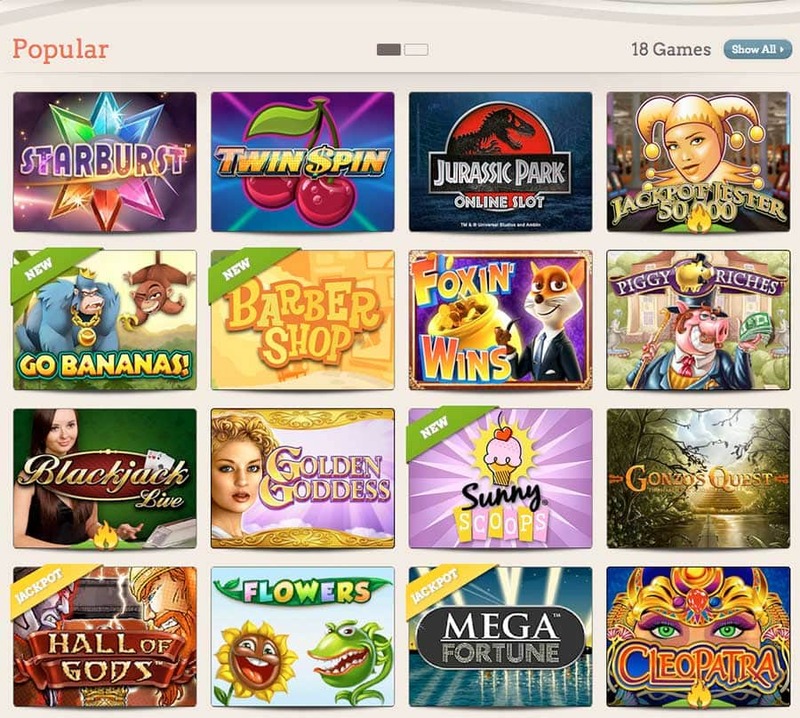 The site features games from NetEnt, Microgaming, Viaden Gaming, Nextgen, Evolution Gaming, Cryptologic, Betsoft, Play'NGo, and Yggdrasil Gaming. 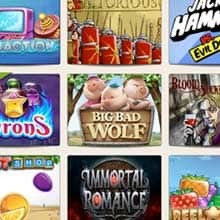 By using some of the most popular games from multiple reputable companies, Leo Vegas is able to present a very wide range of choices, so most players, regardless of individual tastes and preference, will have no trouble finding the right games for them. All in all, Leo Vegas online casino is a simple no frills site minus the bells and whistles that would make you abruptly stop another activity to log on to play. However, its primary intention is to provide a high quality full service mobile casino that will meet your needs and expectations whether you are playing for half an hour or many hours, and in that endeavor it succeeds. The entire home page is taken up listing and displaying all of the games in their respective categories. Since some of the games might be offered in a variation other than the way you usually play, while other games will be completely new to you, it would be helpful if there were some descriptive information included. However, the casino does offer the option, for all except the live dealer games, to play any game for free before committing to real money. 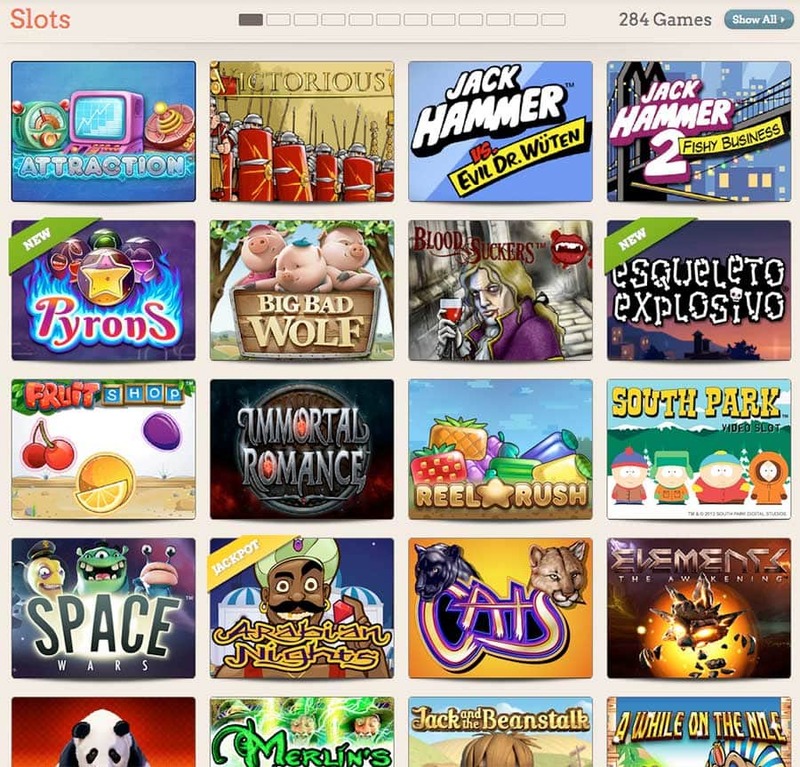 Slot players should be very happy with the ample assortment of some 235 slots. Among them, you will find familiar favorites like Gonzo's Quest, Tomb Raider and Jack Hammer, along with other slots that will be new to you. You can choose from many varieties of both classic and video slots, along with 13 progressive jackpot slots, including the extremely popular Mega Moolah and Mega Fortune. Video poker and table game players also have a wide choice of games. Roulette players are not restricted to the high house edge American Roulette with both a single and double zero; they can choose either European or French Roulette with better odds. Blackjack players can enjoy an even bigger choice, including American or European Blackjack, as well as other variations of the game such as "Professional Series" Blackjack, and single deck and double exposure blackjack. Live dealer games, a surprising find for mobile casino play, are another great option. Play blackjack, roulette, baccarat, casino hold ‘em, or 3-card poker with a live dealer and elevate your mobile play to a whole new level. All the while that you are many miles away from any brick and mortar casino, playing on your phone and tablet, you will indeed feel like you are playing in a real casino. Given the newness of Leo Vegas, this reviewer would have liked to see information reported on the website regarding recently documented findings on average game payouts. Unfortunately that information is missing. However, the casino is to be commended for responsibly allowing players the opportunity to set their own limits. Leo Vegas internet casino does not offer as much choice in banking methods as larger online casinos whose clientele is more international. However, the methods that are accepted should be sufficient for the players using the site. Check with the casino to see if the method you wish to use for deposit can also be used for withdrawal. Leo Vegas casino online is known for speedy withdrawal processing, usually within 24 hours, although it could take up to 3-5 business days depending on the method. Deposits and one withdrawal per month are free; a charge is incurred for additional withdrawals. The primary unit of currency at this casino is EUR. However, GBP, AUD, and the Swedish Krona are also accepted. All deposited funds are kept safe and secure in a Swedish bank. In addition, the casino uses Digicert, a trusted security software provider, to ensure that the personal information and financial transactions of all players are fully protected. No unauthorized users can gain access to any player's account. Play at Leo Vegas Casino is safe. Some online casinos hand out their entire Welcome Bonus for new players as soon as they register and open an account, on day 1. Others, like Leo Vegas, hand out the Welcome Bonus in stages. The Leo Vegas Welcome Bonus is given out in four parts, coinciding with and a designated percentage of a player's first four deposits. Since the bonus does come with country restrictions, you will need to check beforehand to see if your country is eligible. The portion of the bonus you receive with each deposit is indicated at the beginning of this review. The manner in which each component of the bonus is allocated is rather complicated, but the bottom line is that you can receive up to 400 euros all together, provided that you deposit the maximum applicable amounts each time. Your total deposit will come to 1925 euros. The required playthrough for withdrawal for each part of the bonus is 35x the bonus. If the amount of wagering required with the maximum bonus is more than you can afford, simply deposit less and take a smaller bonus. Also, keep in mind that while slots, parlor games, and Keno count 100%, video poker and table games only count 10%. In other words, for all practical purposes, the Leo Vegas Welcome Bonus is a slots only bonus. In addition to the money included in the four-part bonus, the Welcome Bonus also includes 200 free spins on Starburst. Eligible players receive 20 spins on day 1 as soon as they sign up and make their initial deposit into their account. Then, they get an additional 20 free spins daily for 9 more days. Each set of 20 spins is valid for 24 hours only. Any winnings from the free spins also have a 35x playthrough requirement for withdrawal. One good thing about these bonuses is that just the bonus, and not the player's deposit, as at some casinos, factors into the playthrough requirements. In addition, deposited funds are drawn on first, and any winnings from the deposit are made available for withdrawal immediately. However, once the bonus starts being used, the playthrough requirements go into effect. Customer Service is available 24/7 to answer any player questions and concerns. The service can be accessed via live chat, phone, or email. Supported languages include English, Swedish, Norwegian, Finnish, Polish, and German. The casino claims to have a tiered loyalty program. However, the specifics of how it works and what kinds of rewards are forthcoming are not disclosed on the website. This information needs to be provided because being rewarded for continued play is a major incentive for wanting to return to play at a particular casino often. From time to time, Leo Vegas online casino may come up with special promotional offers. Be sure to check regularly so you don't miss out. The first thing that is very important to know about the mobile version of Leo Vegas is the number of its games: a whopping 280! It is one of the absolutely largest mobile casinos currently in existence. This is all supported by simplified and streamlined graphics and menus, keeping gameplay simple and straightforward. Whatever you are looking for, you will find it immediately. 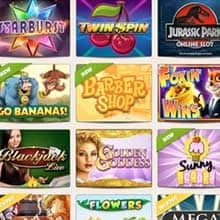 The only downside of the mobile app is the lack of Live Chat when it comes to customer service, but that’s a small price to pay for a superb mobile casino. Leo Vegas was created to be a mobile casino before anything else, and this can be seen in the wide number of platforms it can be accessed from. Any smart device with a browser can be used to bet at Leo Vegas, and while the software can be downloaded, that is not necessary to play. The fact that the casino was created with mobile devices in mind can also be seen in the smoothness, clear colors and excellent visual transitions of the graphics, regardless of the size or age of the device. If you are a mobile casino player, Leo Vegas is your best option. Apart from being highly successful, very popular and absolutely jam-packed with games already despite being only 4 years old, Leo Vegas is also a beautifully styled casino in terms of visuals. Rather than going for the common colorful, flashing look, it has stuck to a more traditional land-casino style, simple, streamlined graphics and straightforward menus and option lists. This makes registering and betting a quick and easy process that takes just a few minutes. Leo Vegas was created with the mobile users in mind but it looks great and works flawlessly regardless of the device you use to access it. It is not a casino to miss! Join Leo Vegas Casino today and get your €400 bonus!